Over the weekend, my husband and I were in Augusta for the wedding of our friend Bo and his beautiful bride Emily. The ceremony was held in a former Catholic church that is now the Sacred Heart Cultural Center, and it was fun to see such a lovely wedding in such a unique venue. 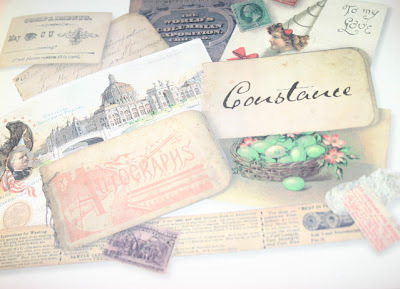 My DH knows that when we are out of town, I like to check out the antique stores and boutiques there, and happily I came home with several goodies from Augusta. 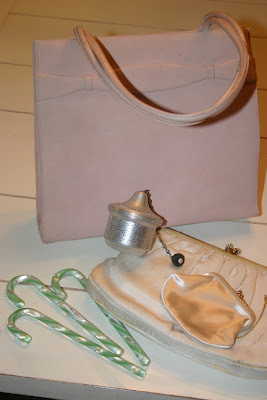 My "tea goodies" from one store included two vintage purses (a faded pink suede model and a cute little ivory clutch with an attached coin purse). When my nieces visited for Christmas, I realized I didn't have enough "dress up" purses for playtime, so I'm determined they'll be back for tea and have a larger stash of tea party clothes and purses to choose from. It is the official policy of this blog not to worry about calories and fat and grams of sugar until after Jan. 1, 2008. We will, of course, join the rest of the country in the produce aisle next Wednesday, but for today, we feel it is time to extend the celebration with a few more comfort foods and desserts. This is the quick-and-easy pie I made for my family on Christmas Eve. My niece Madison requested the recipe, so I thought I'd include it here as well. It's great for using up that extra cup of chocolate chips or that extra bit of coconut you've got left from your holiday baking. This is a recipe I was fond of making about 10 years ago, so I was happy to become reacquainted with it this year. Hope you enjoy it! Beat margarine, sugar and vanilla well. Add eggs. 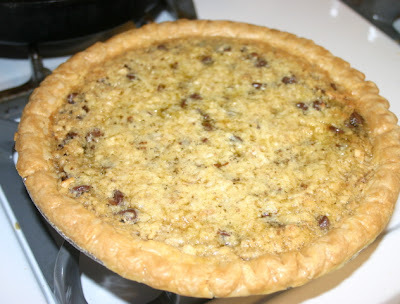 Stir in flour, chocolate chips, nuts and coconut. Pour in pie shell and bake for 35-40 minutes at 350 degrees. Let cool, then refrigerate to help pie set. Consistency will be similar to pecan pie. Dec. 30, 1837 - "Sally had kept her promise, appearing at the cabin when the trillium was in bloom. Together we went on the first of many walks into the woods, where she introduced me to the wonders that had been sprouting right before my eyes. There was skunk cabbage for seizures and burdock for boils; horsemint to relieve headaches and wild cherry to cure colds; the bark of the willow, she said, relieved pain, while the white oak cleansed wounds. I learned the preparation of compounds and decoctions, poultices and teas, and was shown new foods to harvest from the forest floor." Gentle reader, I cannot remember the last time I was as crazy over a book as I am this one! I was at a local bookstore checking out with some magazines last Friday when I saw this lovely, clearance-priced book tossed on a bottom rack at the checkout counter. 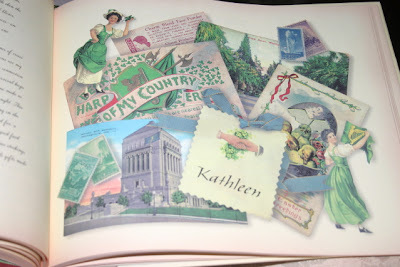 The Victorian looking artwork and collages throughout the book caught my attention, and it wasn't until I got home with the book I realized it is actually a work of fiction. 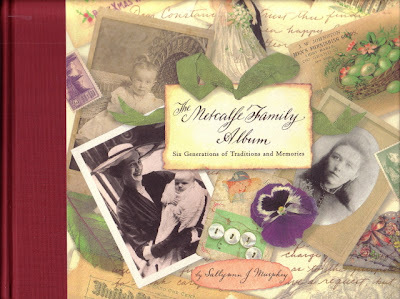 The author has written such a believable work, however, that you'll be convinced these six generations of Metcalfe women really did exist. The icing on the cake was the discovery of numerous references to tea in the book, including a chart showing which plants the women of yesteryear used to make teas and what maladies they were said to cure. 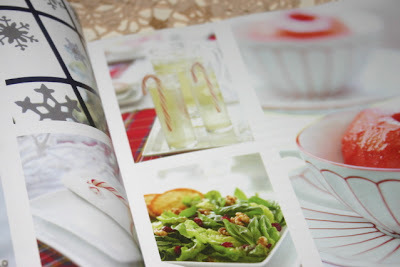 And although this is not technically a tea book, I find it a very useful volume because of all the heritage recipes each woman includes, foods such as Christollen Bread, Lebkuchen (Honey Cakes) and Pannetone. I finished the book on Christmas Day, and it was the perfect book to read this particular week since typically, the Metcalfe woman wrote entries about the year only at Christmas or the few days following. Want your own copy? I checked, and they're available brand new on Amazon for just $4.99. I find most modern novels so raunchy and/or dreary, I am delighted to have found something so enjoyable and uplifting to read, even if I had to go back to a 1999 book to find it! Merry day-after-Christmas! I hope yours was as good as mine. My husband and I went to my parents' house, where Mom had the usual huge, delicious dinner. Along with my aunt and sister's family, we opened tons of presents before recovering enough to eat more sweets. Then it was home, where I was happy to take a nap and finish reading a new book (a terrific book which I'll be telling you about soon). This morning, I saw on TV where some folks are already lined up at the malls to take back some of their gifts. Shudder, shudder, shudder. I am quite blessed that friends and family all got me things I love, so there's no "return desk" in my future. 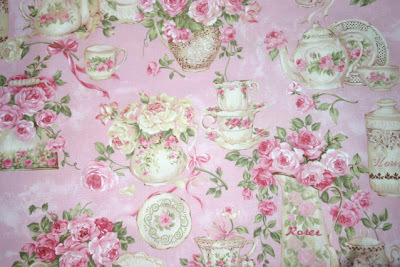 But when you get so many pieces with pink roses on them, there's no need to return! Case in point: My DH tends to get me teawares and jewelry (in recent years, silver Pandora beads, and this year he has filled up the bracelet, I think). 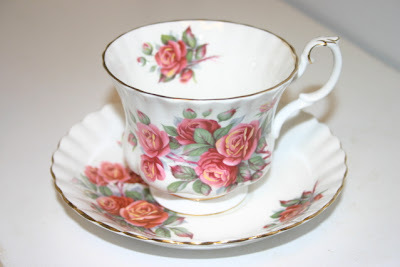 I am accumulating a lovely collection of pink rose teacups thanks to him, and Christmas was no exception. 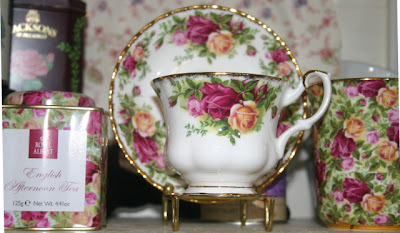 This time I got a great teacup and saucer set in the Centennial Rose pattern by Royal Albert (top photo). 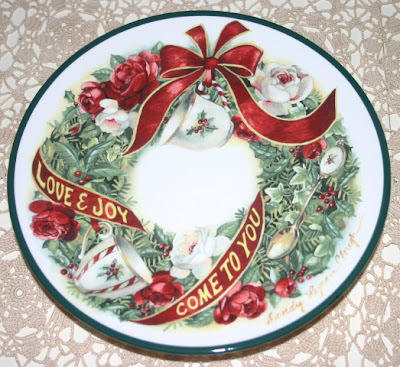 On Christmas Eve, he stood staring at the Old Country Roses set in my tea cabinet (above). Uh-oh, he said. What? I asked. I think I got you a duplicate of something, he said. I told him not to worry, that if it was a duplicate OCR that would be just fine. Turns out it wasn't a duplicate at all, even if it was a member of the same china family, so to speak. Either way would have been fine, but I was especially glad to get a new pattern with pink roses on it. 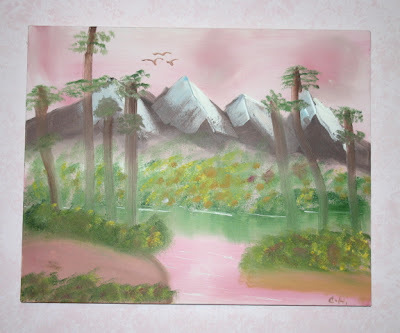 And speaking of pink ... this doesn't have roses on it, but I wanted you to see one of my favorite gifts, this pink-hued painting by my sweet eight-year-old niece, Cari. Can you believe she painted this just for me? It is proudly hanging in my sewing room. (She was here Christmas Eve and called it my "designing room," a term I rather liked.) It's so nice to receive a gift you wouldn't dream of returning! And so, I end this post wishing you, if necessary, many happy returns today! From my home to yours, may you all have a very Merry Christmas! I hope things are peaceful at your house this morning, as they are at mine. 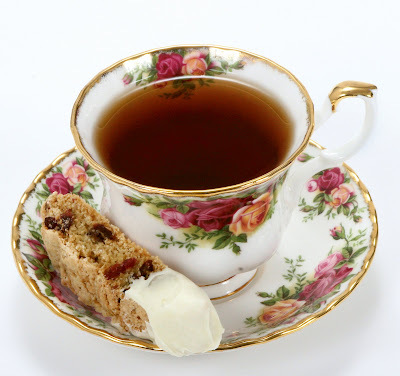 All the packages are wrapped, the visits are winding down, and this was a good morning to revisit the 25-year-old classic by Tom Hegg, "A Cup of Christmas Tea." This book was read aloud at a memorable Christmas tea I attended some years ago. It's the tale of a nephew who feels guilty about not visiting his elderly aunt, so finally he breaks down and decides to take her up on her offer to share "a cup of Christmas tea" with her. In the process, he finds he is tremendously blessed himself, and lo and behold, the aunt helps provide those magical old Christmas sentiments. 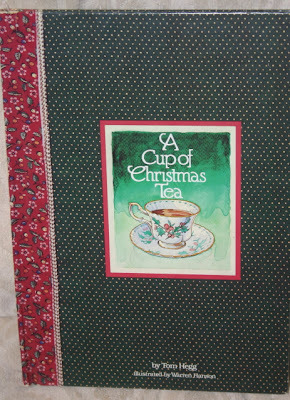 Do you have a "Cup of Christmas Tea" sort of Christmas memory? I do. I was volunteering at a homeless shelter, and Christmas was just days away. A very generous community had donated so many gifts there was barely room in the small office for me to sit down behind the desk. Every woman and child had received everything on their wish list, and gifts were still pouring in. Candy, meals, treats of every sort arrived in a steady stream. There was a knock at the office door, and I looked up to see Lynn, who'd been living there after she'd finally (hallelujah) gotten away from an abusive relationship. For reasons I still don't understand, Lynn had taken a liking to me. She'd had a rough life, she was almost overjoyed to get a job at a local fast food place, and she just really touched my heart. Well, Lynn walks in with a gift-wrapped present for ME, and I nearly died! A woman at a homeless shelter had a gift for me? How humbling is that! "Oh, I HAD to get you a present, Angela!" she said, beaming with Christmas joy. I wanted a hole in the floor to open up and swallow me. I unwrapped the gift and found a box that had the name of a local dollar store imprinted on it. 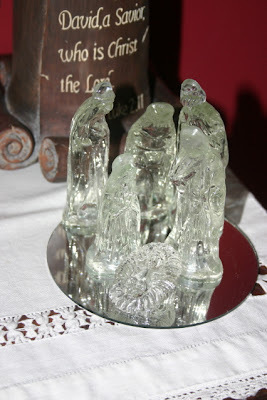 Inside was a small glass nativity set. Each year when I unwrap the pieces for display, I remember that it is one of the most "expensive" Christmas gifts I have ever received. And wherever she is in the world, I hope Lynn and her child are doing well, and I'm thankful for the lesson she taught me. For those of us who celebrate Christmas, we remember the gift of the Christ child, the most "expensive" gift God could have chosen to give us. Like God, she graciously gave a gift out of the abundance of her heart. My job was simply to learn to receive the gift. Just wanted to share my "Cup of Christmas Tea" inspired story and wish you all a peaceful and blessed Christmas! Finished up at the office? Check. Bought last-minute gift? Check. Got haircut? Check. Posted on my blog? Uh oh! 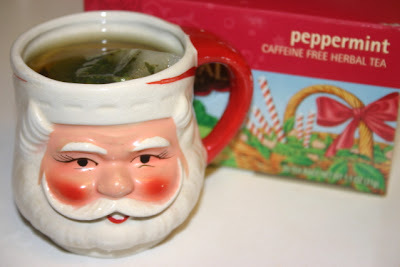 And so, now that all is calm (if not so bright) at my house, I wanted to share some quick ideas that have helped me use up all that peppermint that arrives each Christmas. Here, you see a piece of peppermint waiting in a teacup for the addition of some black tea (PG Tips, actually) and then melting into the tea. I'd forgotten how strong PG Tips is, so I actually added another piece of peppermint and enjoyed quite a flavorful cup of tea. Another last-minute idea for peppermints: Last year, I baked a "cake mix" vanilla cake in one of those new silicone Christmas-tree shaped pans, frosted it with store-bought white icing, and "decorated" this sweet tree with peppermints I pulsed in the food processor. 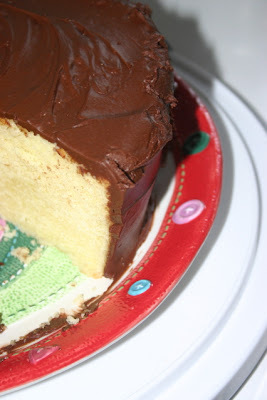 Not only was this super quick and easy, but a day or so later the peppermints sort of melted into the icing and it was quite yummy, far better than I expected an out-of-the-box cake to be. For months I've been wanting to try a Flickr Badge, but early in this blog's life I didn't have enough photos to make it worthwhile. Today, I see I have acquired enough to make my first badge, and it appears at right! This reminds me of those year-in-review pieces you see on television at this time of year. I guess this can serve as my Blog Year in Review, so enjoy! Not long ago, I was thinking about what artwork I want to have at the top of this blog during the winter. It's easy to use the floral teawares in spring, summer and fall, but I just don't think there are very many teawares that say "winter." 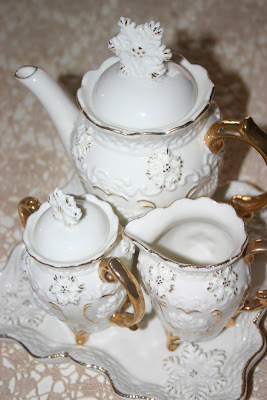 On Monday, my co-worker Summer told me she'd been helping clean out her grandmother's garage and came across a snowflake tea set she thought I might be interested in. Would I? Indeed yes! The set magically appeared on my desk a short while later, and I took it home and unwrapped it all. Now I'm trying to think of some winter-themed tea "accessories" I can photograph, and you can be sure they'll be pictured alongside this unexpected, delightful new gift. So there you go: Summer helped solve my problem about Winter. Cool, huh! But since out there in the real world it's not yet Christmas, I wanted to share an easy treat that is perfect with a nice cup of hot tea, which I will be enjoying as I relax and DON'T think about proofreading tonight! Preheat oven to 300 degrees. In a small bowl, beat eggs, vanilla and almond extract with wire whisk. In mixing bowl, combine flour, sugar, baking soda, salt and cranberries. Add egg mixture and stir just until blended, about 1 minute. Divide dough in half. On greased and floured baking sheet, arrange dough into two logs, about 1/2 inch thick, 1-1/2 inches wide and 12 inches long. Place logs 2 inches apart and bake for 50 minutes or until golden. Cool for 5 minutes. Next, place log on a cutting board and, using a serrated knife, slice on the diagonal, about 1/2 inch thick. Place the slices flat on a baking sheet, lower oven temperature to 275 degrees, and bake for 20 to 25 minutes more, turning once for even baking. Melt white chocolate chips in microwave, and glaze biscotti as desired. Makes about 3-1/2 dozen pieces. Finally, I have the Christmas decorations in place! My dilemma this year was that I never found a "theme" to organize around. I've decorated with Victorian pink ornaments, chunky (think "forties") light strands and tinsel, and even the silver aluminum tree so central to my earliest Christmas memories. So I went with the silver tree in the living room this year, but over the weekend I found a new tabletop tree, this pink tree from Hobby Lobby, on sale for half off. It is the perfect new home for my teapot and teacup ornaments. As I pulled the ornaments out of their wrappings, I was struck by how very many of these were gifts. Out of 25 ornaments, I believe only three are pieces I bought for myself. One of the first teapot ornaments I ever received was this musical one from a friend who said she thought of me when she saw it at the San Francisco Music Box Company. I've had it for years now, and it still plays "My Favorite Things" just beautifully. 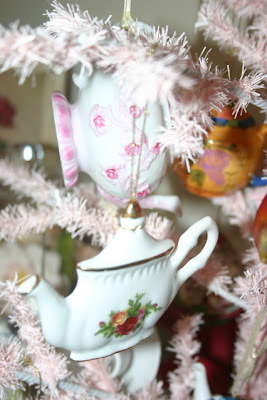 I have more teapot ornaments than teacup ornaments. 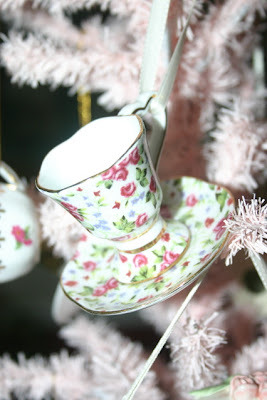 My friend Beth gave me this chintz teacup ornament last year, I believe, one of only a few chintz ornaments in the group. The large pink ornament at back was from my friend Elizabeth in Arkansas, and the classic Old Country Roses ornament in front was a gift from my friend Sandra. 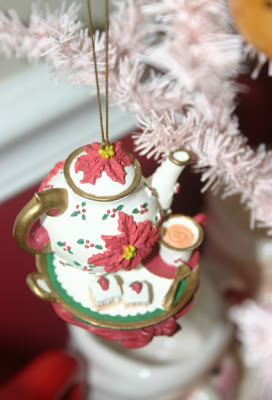 This teapot ornament, from my friend Susan, has long been a favorite. This blue one I must have bought for myself, but I can't remember when or where or why. I like the effect of all these ornaments on the pink tree so much, I may move this to my craft/sewing room when Christmas is over and enjoy it all year long. 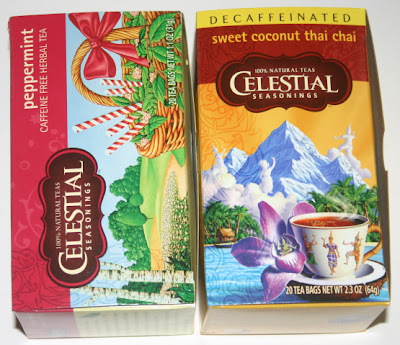 You may have heard (or seen) that Celestial Seasonings has new packaging. When I heard that, at first I got my hopes up that at long last, they were individually packaging their tea bags, but alas, no. They've done a nice job of updating their graphics, but I still usually favor their competitors since individually packaged tea bags are more convenient and travel well. Then I got a press release the other day that prompted me to go buy two new boxes of CS tea. It seems they are promoting their new theme of "Tantalizing Adventures for the Senses" with a new online book club. I promptly joined up, which required getting two UPC's from the new boxes of tea, so I *should* be receiving my free "book club starter kit" (which includes recipes, bookmarks and more) before too long. I read so much for my job that I'm not really a good book club member, although I'm willing to give this one a try. 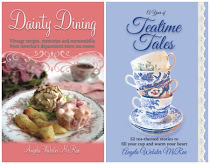 If you are a devoted tea drinker and reader, you might want to visit celestialseasoningsbookclub.com. The teas I chose were Peppermint (one can never have too much Peppermint at this time of year) and Sweet Coconut Thai Chai. I took the chai to the office, and with a little office creamer added, it was pretty tasty stuff. Retro books can be fun to look at, and I especially enjoy reading the sections about the coffee and tea services of the past. 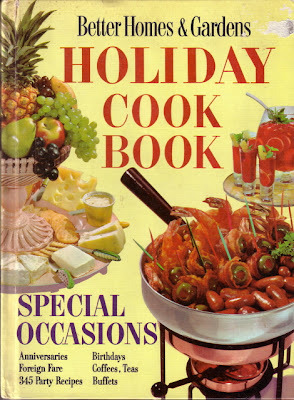 I have several vintage cookbooks that have sections on teatime, and one of the most fun is this Better Homes & Gardens Holiday Cook Book from 1959. It is truly a blast from the past! 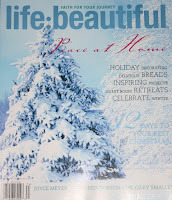 Just looking at the cover makes me want to go put on some Dean Martin Christmas music. 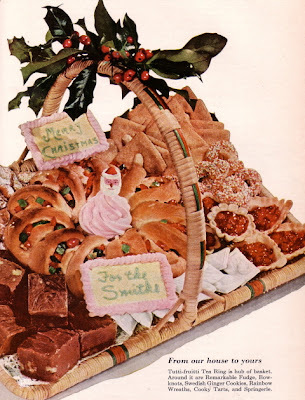 The caption on this photo notes that "Tutti-frutti Tea Ring is hub of basket." 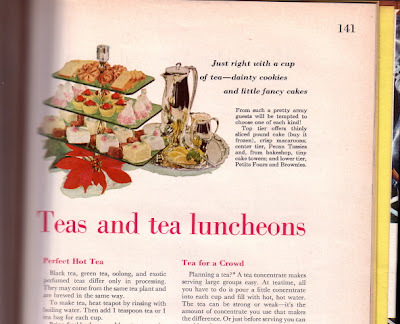 And the section on "Teas and tea luncheons" is quite quaint, although the tea-making advice back in the day would no doubt strike most of us as WRONG: "Black tea, green tea, oolong, and exotic perfumed teas differ only in processing. They may come from the same tea plant and are brewed in the same way." And yes, they mean just that! It goes on to say you should steep ALL teas in boiling water for 5 minutes. Imagine! 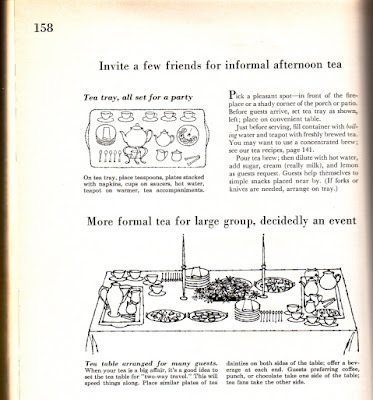 More helpful is the chart at the back of the book which shows the suggested set-up for a party tea tray and for a more formal tea. And there are also step-by-step photos for creating their "dainty" checkerboard or diamond-shaped tea sandwiches. 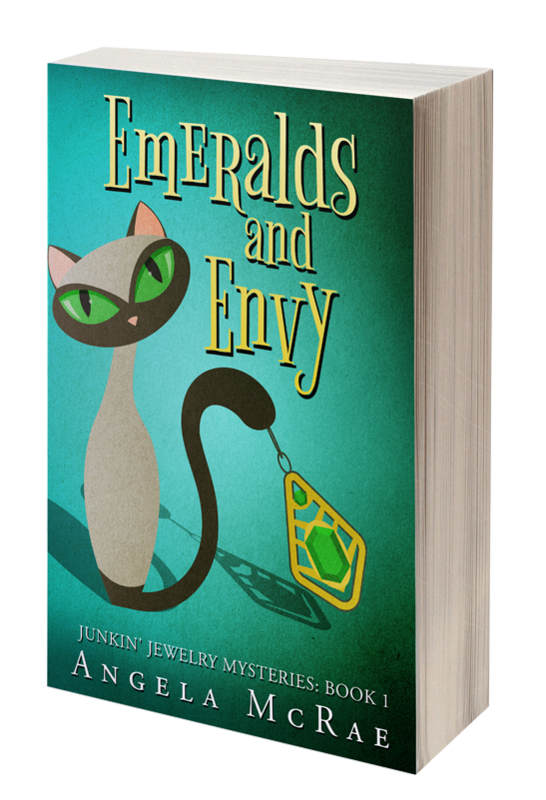 If you see this book on eBay or at an antique shop one day, it would be a fun addition to your tea library. 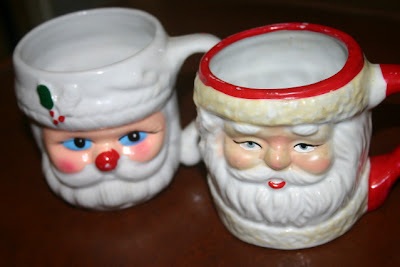 Much as I love cups and saucers, I have to say I really enjoy sipping tea out of my Santa Claus mugs at Christmas. Last night, I began unwrapping them and brought them in from the garage so I can begin figuring out where I'm going to display them all this year. I'm thinking of wiring some of them into a wreath. To kick off this festive sipping season, I chose this little guy. 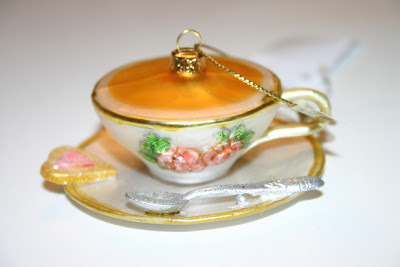 I like this one for its vintage look and diminutive size, about the size of a teacup, which is the perfect size for serving up a cup of Christmasy peppermint tea. My co-worker Nichole started it all. 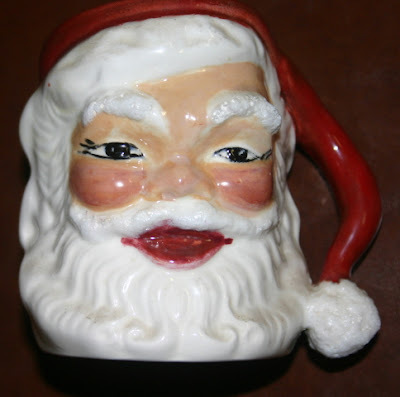 Some years ago, she heard me say I was "thinking" of beginning a collection of vintage Santa Claus mugs. A quaint little antique store was located across the street from our offices at the time, and so I had to walk past their window display of mugs daily. She gave me two as my Christmas gift that year, and thus began a collection. I believe these two are the ones she gave me, but alas, I never marked them, so I can't be sure. But hey, who is going to argue with me? Other "enablers" in my collecting include my mother, who has supplied probably 50-something of my 70+ mugs, and my friend Sandra, both of whom have always enjoyed the search for a fun collectible. Big ones, little ones, old ones, new ones, simple ones, elaborate ones, winking ones, blinking ones ... I find them all just charming. 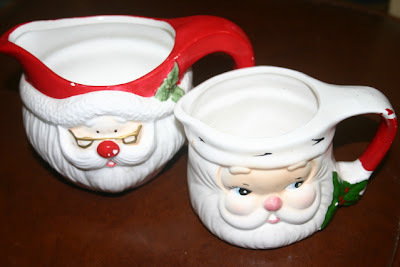 These Santa-mug cream pitchers my mom found are rather hard to come by, and I hope to find the matching sugar bowls one day. A gift from my friend Sandra, this guy reminds both me and my husband of our magazine's chief photographer, Bob. 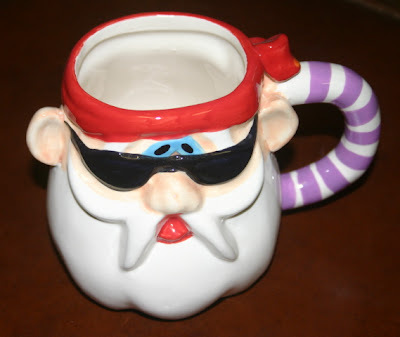 And finally, a great departure from my usual "pink roses" motif in teawares, this biker-guy Santa was another recent gift from my mom. I don't know why, but I find him just hysterical! 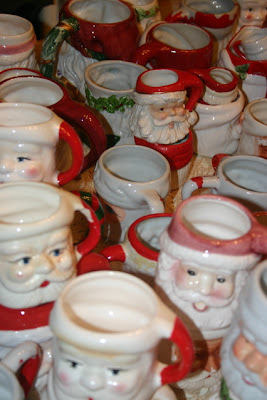 Do any of you collect Santa mugs? If so, I say, try using them for tea this Christmas. Why on earth should hot chocolate have all the fun? 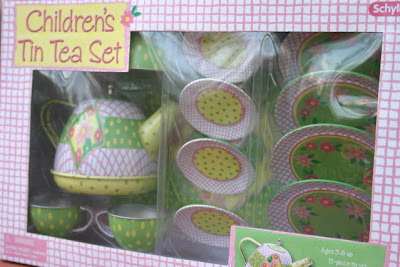 This particular tin tea set appeared in a magazine a while back, but when I checked into ordering it I found the shipping would be about as much as the tea set, so I promptly forgot about ordering it. But boy, I loved that little set. It's so vintage-looking, so cute and retro. If only the shipping weren't so much. Then during a recent Christmas shopping trip to The Wynn House in Newnan, one of my favorite local gift shops, there among the toys was this tea set! 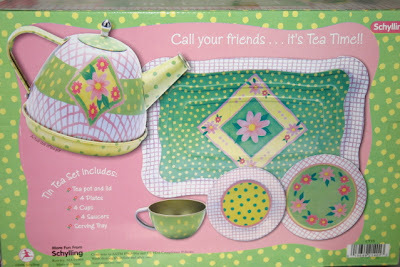 I was pleased to see this set has been approved for food use by the FDA, and I do hope my sweet niece enjoys using it. I figure it's never too soon to start instilling a love of tea! On Friday I left work around noon to go to an out-of-town concert that evening, but before I did my friend Susan called to ask if I'd be there a few more minutes, and if so she would be dropping off something for me. Hmmm ... it wasn't like Susan to drop off a Christmas present so early, so what could it be? Soon, the receptionist called to tell me my surprise was waiting downstairs. Isn't this packaging just lovely? Most of my friends are pretty good cooks, but only a few of them are what I consider "perfect" bakers, and Susan is one of them. To get a treat from her any time is a delight. 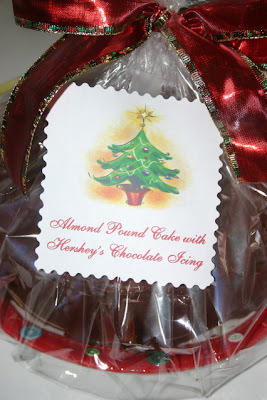 The card attached to this divine Almond Pound Cake with Hershey's Chocolate Icing said she was giving the cake early so I could use the Christmas-themed cake plate over the holidays if I wanted. Isn't that thoughtful! 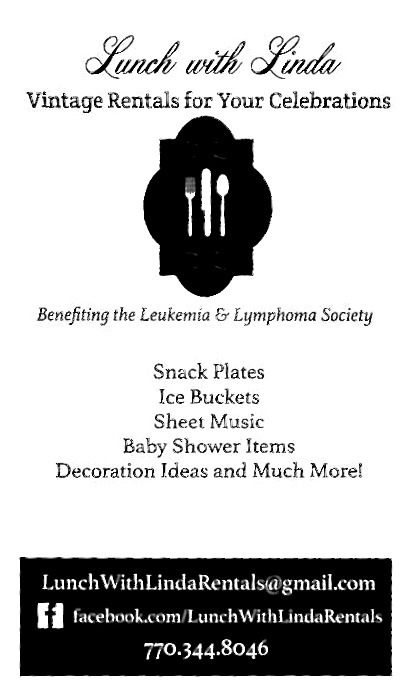 And note the button-and-thread design on the cake plate (detail below). 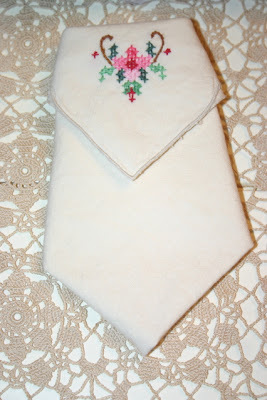 Susan shares my love of needlework, so I'm sure she knew I'd love this. Soon, I had the very pressing problem of choosing which tea to enjoy with such an incredible dessert! Over the summer, I attended Pearl Dexter's session on pairing tea and desserts at the World Tea Expo, which made me think about the teas enjoyed with sweets. 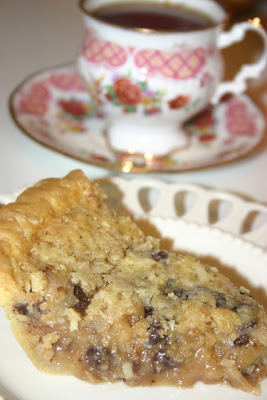 This cake was such a special treat, I really wanted to be intentional, as we say, about what tea I paired with it. On Saturday and Sunday, I enjoyed a single slice each day, stopping at the halfway point of eating the cake to brew a different tea. On Saturday, I had the cake with Harney's White Christmas Tea (which has almond flavor, like the pound cake) and then with a coconut flavored white tea. I actually liked the white tea best with the cake, which really surprised me! Then on Sunday, I tried the cake with Stash's Chocolate Hazelnut tea (very good) and then an unflavored white tea (excellent). Again, I preferred the white tea. I plan to try even more teas with it (purely in the interest of research, of course). And in a virtuous moment, I did slice off half the cake and put it in the freezer so we'll still have some to enjoy at Christmas - with more tea! 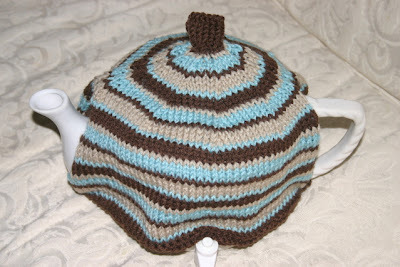 Last night while watching the cable news shows, I was finishing knitting up my first tea cozy. At the time I really wasn't that interested in the possibility we'll have the first Mormon president, the first woman president, or the first black president, but I would have been quite interested if you had told me we might have the first knitter president. Maybe that candidate could tell me how the dickens to "M1" in the world of knitting direction! This surprise abbreviation appeared at the very end of my cozy knitting, and the glossary said it means to "Make 1 by picking up thread before next st and K into back of it." Huh? 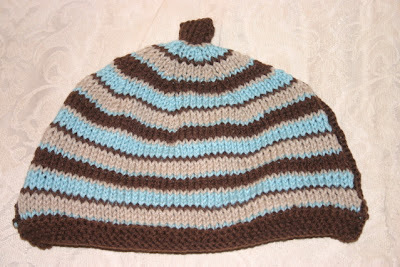 I am not an experienced knitter and had to really wing it on this one. 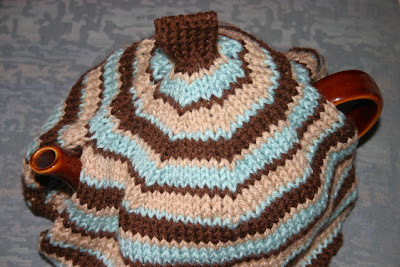 I must also confess that silly me, I didn't realize you are also supposed to knit a LINER -- to keep that teapot really, really snug and cozy, I suppose-y. And I just don't feel like doing that, because my cozy was more for looks anyway. I never let tea sit around long enough to get cold. So ... 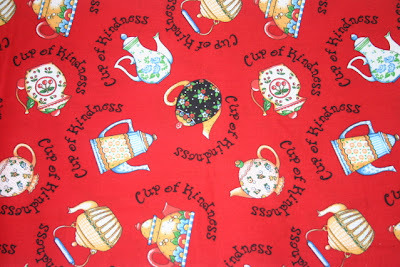 I slipped it onto my 6-cup Brown Betty teapot, but the cozy was too large and I nearly lost her! "Betty! Helloooooo! Are you in there???" Then I remembered that humongous 12-cup teapot (with spout) I got last summer. Perfect! Well, "perfect-except-for-the-spout," but still. I have a teapot to model my first knitted tea cozy, and I have now knitted something a bit more challenging than a simple square dishcloth. Next time, maybe I'll even knit the liner! Living in the overly dry Southeast, I can't say I'm dreaming of a white Christmas, but I *am* keeping my fingers crossed for a good snow or ice storm this winter that will keep me stranded at home for a few days. There are just too many craft projects I'd like to get going on, and finding new teacup prints at Hobby Lobby didn't help the backlog. 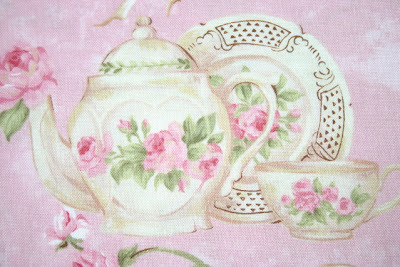 The pink print is Rose Garden Tea by Ro Gregg for Northcott fabrics. Isn't this gorgeous? It was 25 percent off, so I got two yards so I'd have a decent piece to plan a quilt around. 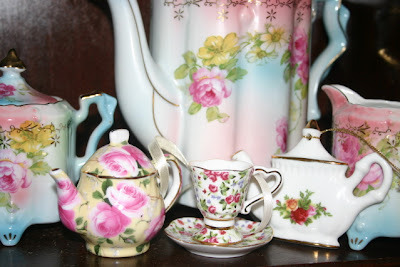 Pastels are my favorite, but when I see whimsical teapot prints in bright colors, I like to get a small cut of that, too. This red print is by Mary Engelbreit, and though I can't find a name for the design, it's a 2006 print from Cranston. This will get added to the small but growing stash of brightly colored designs that will one day became teacup and teapot blocks in a colorful quilt. Yesterday was the annual Christms shopping day for my mom, aunt, sister, nieces and me. We've found a weekday early in December works well for power shopping. You avoid the weekend crowd, and shopping with my nieces along insures they get a garment they will wear (some cute jackets, this year). 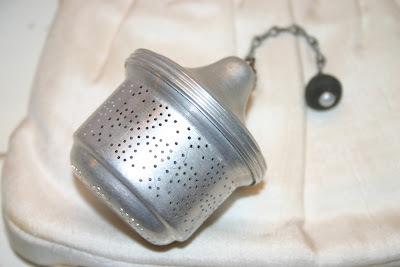 I also found a great deal on a tea gift for a friend, but since that friend reads this blog we can't go THERE, can we? 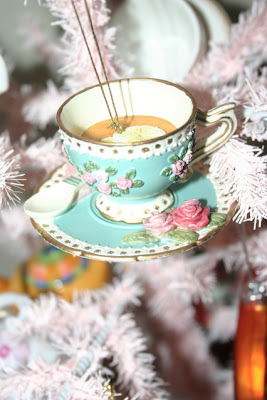 I can say, however, that on the way back home last night, I stopped by a Hobby Lobby store and found some tea-themed ornaments, the first new designs I've seen this year. (HomeGoods stores have some porcelain ones, but I've already got some of them.) These from Hobby Lobby are inexpensive little glass ornaments (they're currently half-off), and I really like the spoon and cookie accents on the teacup ornament at top. 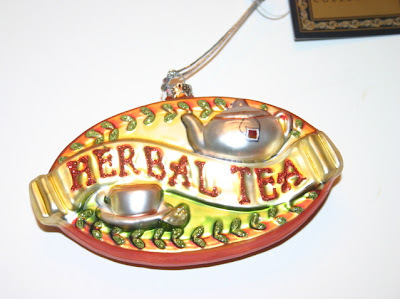 The other ornament was interesting because it says "Herbal Tea." I guess some marketer knew that was a term that would catch somebody's eye, eh? 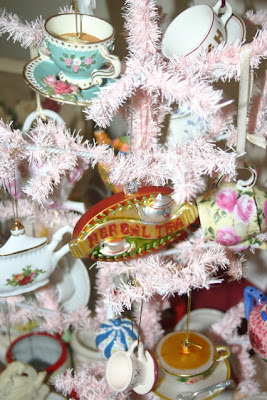 The teacup ornaments in my collection probably number about two dozen (I'll need to count when I decorate the Christmas tree), and some of them are so pretty, I keep them on display all year round. 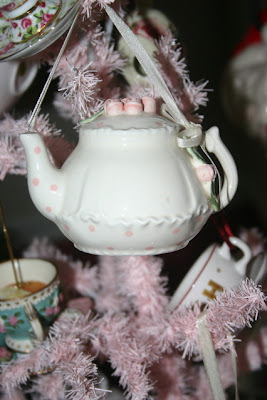 Have any of you seen tea ornaments anywhere this year? Care to share? 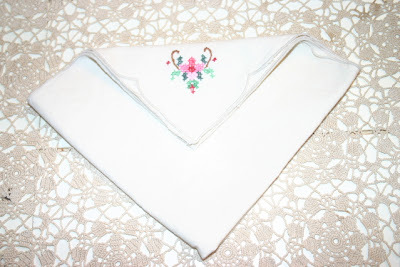 If you're looking to dress up your tea table or your Christmas dining table, one of the easiest ways to add a special touch is to try a new napkin fold. 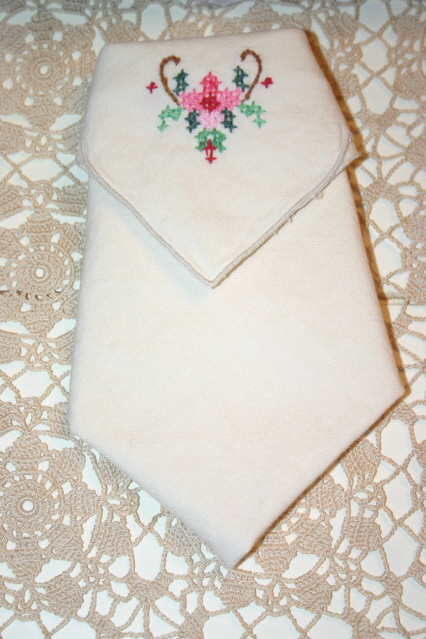 These are some napkins I found for about $3 at an antique mall (because there were only seven), but I liked the little cross-stitch rose detail on the corner. 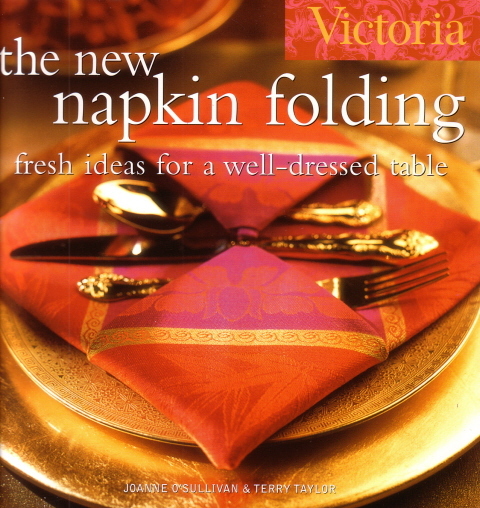 At a casual lunch for six the day after Thanksgiving, I used a new fold I learned from the book "The New Napkin Folding" by Joanne O'Sullivan and Terry Taylor. 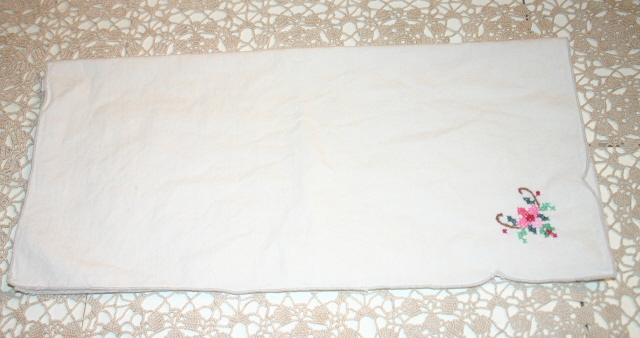 First, simply fold the napkin in half. Next, fold it in quarters. 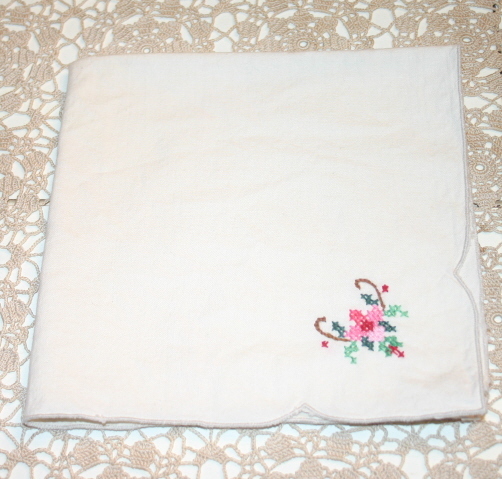 Then, fold down the corner with the rose detail. 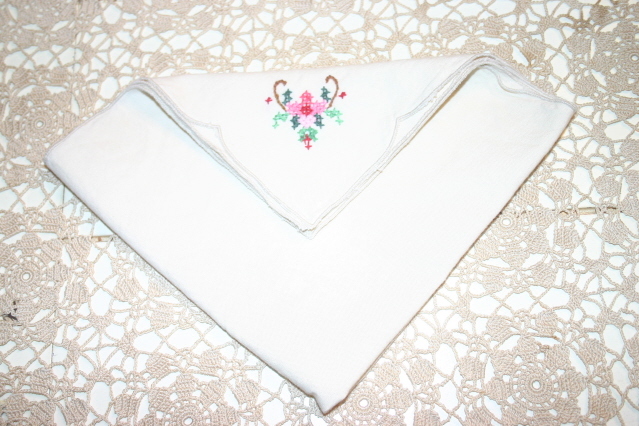 Last, tuck the left and right "wings" of the napkin to the back. 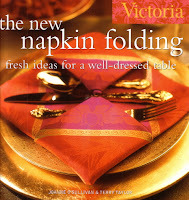 Voila, a sweet little napkin fold, a nice touch for the table, and it didn't cost you a dime! 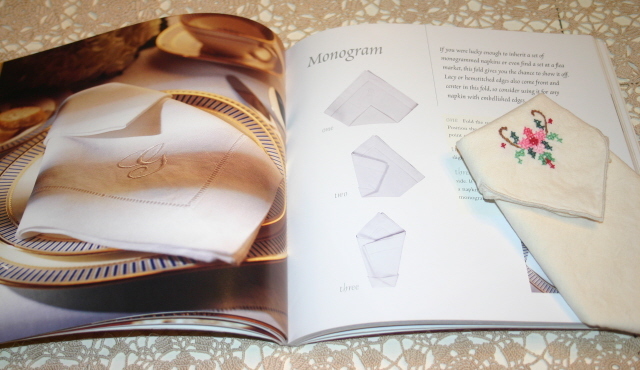 If you happen to own napkins like those with a monogram shown in the book (top photo), this is definitely a fold I'd choose to try. Preparing for "A Woman's Christmas"